A delightful and delicious baked French toast breakfast or dessert you can prepare the night before, making it simple to cook for your family and friends on a special morning, or after a wonderful meal as a dessert. Cut bread into 1-inch cubes. Place half in the bottom of a greased 9 x 7 x 2-inch baking dish. Dice cream cheese into 1-inch cubes. Place over bread. Add blueberries. Top off with remaining bread cubes. In a large bowl, add eggs and beat well. Add milk and syrup. Stir and pour over bread mixture. Cover and refrigerate at least 8 hours or overnight. Remove from refrigerator and let sit for 30 minutes before baking. Cover with lid or foil. Bake in preheated oven at 350 degrees for 30 minutes. Uncover and continue baking 25 to 30 minutes longer or until golden brown and center is firm. In a small saucepan, combine sugar, cornstarch, cinnamon and water. Stir until smooth. Over medium heat, bring to a boil stirring for 3 minutes. Reduce heat and stir in blueberries. Simmer for 8 to 10 minutes. Remove from heat. Stir in butter until melted. 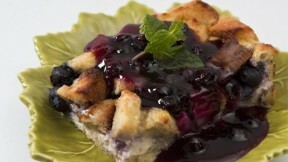 Serve on top of blueberry cream cheese French toast.